Dedicated to the promotion of the best independent music for kids worldwide. Woody Clark is a singer songwriter and schoolteacher from Warburton in Victoria. His debut album Good Morning Kids is quite superb, featuring seventeen cleverly crafted songs about family, friendship, and the beauty of nature. The cover provides a glimmer of the content on offer, with artwork reminiscent of Roger Dean in his heyday. Here the listener is seemingly whisked down memory lane, in a nostalgic tribute to a variety of musical styles including country, blues, jazz and rock, providing something for everyone. The album is delivered with the natural gift of a born storyteller, who is assisted throughout by some unique contributions from family and friends. 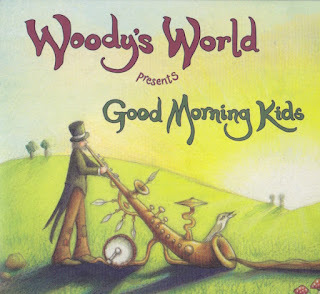 The opening track “Good Morning” is a delightful celebration of the natural environment, as the artist gives thanks for the simple everyday things we sometimes take for granted, from ‘the fish in the rivers to the clouds in the sky’. The song is built around acoustic guitar and piano, and assisted by a strings arrangement, which really lifts the chorus. The song reminded me a little of “Morning Has Broken” by Cat Stevens in sentiment if not in melody. “Catch the Leaves” is another celebration of nature, but this time through providing a musical narrative to the changing of the seasons, accompanied by piano and cello, delivered with the beautiful serenity of a child’s voice. We are also invited on this musical adventure to meet some of the animals that explore such beautiful landscape. The song “Ralph” pays tribute to the much-maligned snake. This particular snake lives under Woody’s house, and despite the subject matter, the song is quite upbeat, with the inclusion of harmonica and acoustic guitar giving the song a bit of a Dylan vibe. “Charlie and Belinda Mouse” is equally energetic featuring a prominent ukulele and a trumpet that (dare I say) reminded me a bit of the Wiggles. “Hercules the Alley Cat” pays homage to Woody’s adopted cat, and was in fact written by his Dad, proving that this album really is a family affair. The inclusion of a saxophone gives the song a nice jazzy feel, with the additional children’s backing vocals adding further impact. Clearly the inclusion of family and friends also adds a certain charm to the CD, conjuring up images of simpler times, when families might sing around the piano before the intrusion of technology. “Friends” takes us on a quick detour into blues territory, assisted by some quite charming children’s backing vocals. The song itself is built around the acoustic guitar, although there is a clever introduction of instruments as the song progresses, with the inclusion of drums adding power, keyboards adding melody, and the use of brass giving the song a more vibrant feel. The music sounds both confident and spontaneous creating the impression that the artist is both performing and improvising and quite comfortable doing so. “Say You Do” is both written and performed by children, the inclusion of which provides further variety to the overall sound of the album. “Storm” reflects on a child’s experience of a thunderstorm, and the fear and challenges this creates. The female lead vocal used here is chillingly beautiful, describing the arrival of a storm with some trepidation. Here nature takes on an intrusive twist, with the song providing a practical guide as to how to combat such storms. With a melancholy piano accompanying the sound of a storm the song reminded me for a moment of Supertramp at their best. “Sing!” although written by Woody, is another song performed by young children. The song is built around a hypnotic bass line, some dramatic backing vocals, and lyrics, which emphasise the importance of singing as a source of happiness and restoration. As discussed earlier, a major strength of the artist is that he is very much a storyteller at heart. In fact, the song “Ralph” begins with Woody declaring ‘here’s a story about Ralph,’ before we are reminded of the way in which we tend to care for animals, and yet forget about the poor old snake. “Whacko Bluey” with its subtle references to Ned Kelly, sounds like a song to sing around the campfire, with its nostalgic references to the past. This song both introduces characters and tells a story, and is essentially an Australian bush ballad with a great melody. “Going to the Show” further demonstrates this story telling ability, with an intro somewhat reminiscent of “Magical Mystery Tour” by the Beatles. We are now in nursery rhyme territory, with shades of Paul McCartney and even George Formby on display. “Mumma’s Having a Baby” describes the eagerly anticipated, and imminent arrival of a new baby. The enthusiastic interjections of the children during the song could be regarded as musically intrusive, but for me provide the track with a genuine sense of authenticity. Once again the song benefits from some lively violin and intricate guitar playing, bobbing along in good old-fashioned foot stomping tradition. “One Man Band” describes the challenges facing musicians as to whether to play solo or with a band. Here the gradual introduction of a variety of instruments is used to welcome the various members of the band. Again there is a feeling of spontaneity, as the track creates the impression that the musicians are literally turning up and improvising as the song is being recorded. Woody is no doubt astute enough to realise that it is probably unwise to release a children’s album without an action song, and the song “Give Me a Clap” no doubt fills the gap. This is an action song that could prove useful for early childhood teachers looking for something different to use in the classroom. I’m sure it would also sound great live, and as I was listening to the song, I could almost imagine a Play School presenter performing it. “I’m Flying”, is another track which could be useful for teachers, as flight is a popular theme in primary schools. Furthermore it’s not difficult to imagine children moving around the music room with their hands outstretched to these lyrics. It also benefits from a beautiful melody, which celebrates the sensation of freedom, something all artists can no doubt relate to. The middle eight uses a clever shuffle beat, and the spacey atmospheric vocal leaves the listener feeling breathless and enchanted as the images on offer hit the mark. The song also reveals further diversity here, with a sound somewhat reminiscent of nineties Britpop - I’m sure even Noel Gallagher would be impressed. Whilst we are on the subject of great songwriters, the best track on the album for me is “Thing Like That", an absolute classic delivered with an attitude and spirit worthy of the Pogues. The song utilises both a lively violin and solid double bass for good measure. It is also melodic, enthusiastically delivered and really quite captivating, with lyrics describing all the crazy things that may occur throughout the day, from requests to have a shower with your clothes on, to the sight of flying emus. If you are ever feeling down in the dumps and need cheering up, this is the song to play, it’s almost impossible to not feel good after hearing it. The song also benefits from a great video that you really should check out at your earliest opportunity. Well if music is supposed to make you feel good, this album pushes all the right buttons. In Woody’s World the listener is taken on a musical adventure, delivered through some delightful songs of genuine authenticity and real emotion. The artist is very much a storyteller at heart, and despite sharing a Christian name with one of the most famous folk singers of all time; there is an earnest originality about the music. His ability to tell a story and describe the setting with such veracity enables the listener to feel a real sense of connection. This musical adventure unfolds like a fairy tale, where everybody is invited, and can equally contribute towards this utopian world, that if it did exist I for one would love to live there. Watch this space for more great things to come from Woody's World! Glad you like it and thanks for letting me know. I'll check out your label it sounds interesting. I have carefully read the article and it was really useful to get an insight of the quality and prices of different brand of digital pianos.Before choosing piano keyboards for beginners you should be focus on best piano keyboard. Bought this guitar for my 8 year old son as a birthday present. The strings are tight and there is a replaceable one in case it got faulty since kids are not very cautious at handling stuffs. It's got the perfect weight so it makes it easier for kids to carry and the sounds are really nice. I love it when my son plays greenday's "Boulevard of Broken Dreams" with it. Now my son can fulfill his dream of becoming a rock-star. Nowadays, a good music concert requires a good piano. Its role depends on the best electric keyboard. There are many companies that sell electric piano keyboards. Midi is one of the best piano keyboards.